It’s my favorite time of year again! The College Basketball season is winding down and the first conference tournament of the year begins tonight. While the NCAA Tournament is the core of March Madness, the Conference Tournaments should not be overlooked as there is plenty of excitement within each bracket. Since this is a stadium website, I like to break down each College Basketball conference and their respective tournament location. It’s not as fun when more conferences nowadays need a plane ticket just to travel to a road game, but nonetheless, long-time lovers of this sport can’t resist getting excited when the calendar hits late February. This year, we welcome the Ivy League to the party, a bittersweet change that ends the 14-game championship. Every conference and tournament location is placed below into one of three categories: “Good”, “OK” and “Bad”. Great move by the Big Sky last year. This is a spread-out conference in the western half of the US and with Vegas already packed with other tournaments, the next best choice is Reno. The Events Center is relatively new and mid-sized, a venue that fits wonderfully. Perfect spot in a basketball-rich city that loves the conference and always supports this tournament well. This post is about best tournament locations, not whether a conference should have a tournament. With that in mind, Yes! 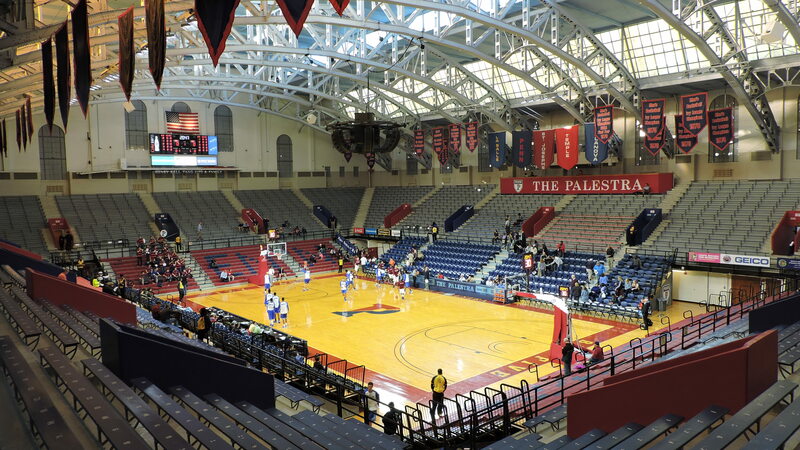 The Palestra is an incredible place to watch basketball already. Can you imagine the atmosphere on a doubleheader semifinal or a championship final? My one qualm: What if Penn gets in for future years as a #3 or #4 seed? That’s quite unfair to the other teams if they don’t bring their own fans. We’ll see how it plays out. A long time home for the OVC tournament that is a natural fit. The venue is perfect for the crowd size and the atmosphere has been pretty good in recent years. New arena, same great neutral site. Vegas baby. New Orleans is centralized and offers a lot for visiting fans. Great move in playing this year’s edition at the Lakefront Arena as that is a much better venue for the Sun Belt, than the Smoothie King Center. I know this conference is too small to generate a big crowd at a neutral site. But I think Springfield, MA and the MassMutual Center is a solid location for them. Side Note: They have unusual spacing between the games with AE’s long-time format as three rounds are spread out over 11 days. Well, it’s not Atlantic City…but it’s a bit better than Brooklyn as Pittsburgh can be considered more “centralized” than Brooklyn. Though Duquense gets an advantage here. Similar boat as the American Conference (just realized their league names are similar). At least Birmingham is kind of the middle for this far-reaching conference. See above (UNLV’s home). How about Salt Lake City? Nothing at all against this fine city and arena, but both Atlanta and the SEC are Kings of the South. This event should stay in Atlanta. The Sanford Premier Center is a beautiful new arena and Sioux Falls is a fine town to host an event. It’s just that the Summit League is so spread out that it is understandably hard to get fans to make the trip. C’mon man, Brooklyn? I hate these big leagues and their spread out schools. I long for the days of seeing the teal and purple court in Greensboro. Games were routine sellouts as most schools were within a six hour radius from the tourney. It really doesn’t matter where the tournament is since this conference is a random mix of teams stretching halfway around the world. The American did take a step back this year as Hartford is a slightly less desirable destination city to bring in fans than last year’s site: Orlando (just slightly). Blasphemy! Well, I guess if you are going to expand to Maryland and Rutgers for $ and TV eyeballs, then anything is fair game. I’ll miss Indy and hope Maryland loses early so that there are a lot empty seats. A great city and warm climate for a tournament…but, it’s not even close to 70% of the league’s members. My heart longs for the good ol’ days in Richmond when this was a Virginia-centric league.